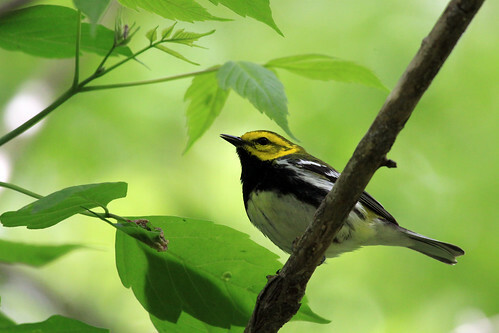 This lovely warbler, characteristic of northeastern coniferous forests, is one of the more common members of its family. The male sings persistently during the breeding season. Laura has attracted several males by making her own imitation of the song. One individual was reported to sing 466 songs in one hour. The zee-zee-zee-zoo-zee song, given near the middle of a male’s territory, serves to attract females. The zoo-zee-zoo-zoo-zee song is mostly sung around the territory’s margins to deter other males.